Just when we thought the “Frozen” craze was over, ABC’s “Once Upon a Time” pulled a fast one on everyone and stuck Elsa in as a teaser at the end of last season. And, frankly, it didn’t disappoint. DAVID: Can I just be the first to say that I love how “Once Upon a Time” does these half-season story arcs? It makes the story lines more complete because there is a clear ending yet promise for a fresh start. 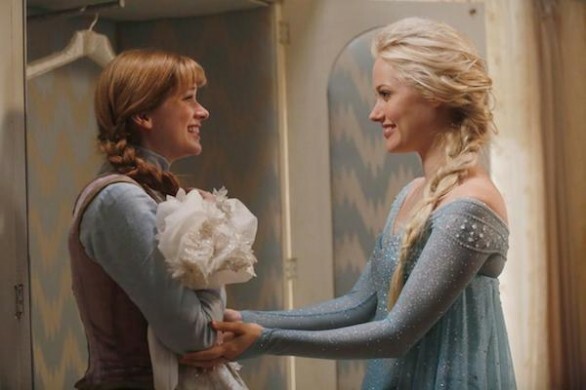 It keeps the show interesting as it rejuvenates characters and introduces new ones like Anna and Elsa. I’m really intrigued by what their parents stashed away in that bottle – I hope it’s not something about true love. I hope it’s a darker family secret of why Elsa’s powers exist or something. Because one would hope we’re past the events of the movie and discovering sisterly love. Then again, this is “Once Upon a Time” and they do like to rewrite fairy tales. Regardless, excellent casting. A lot of questions remain, however. 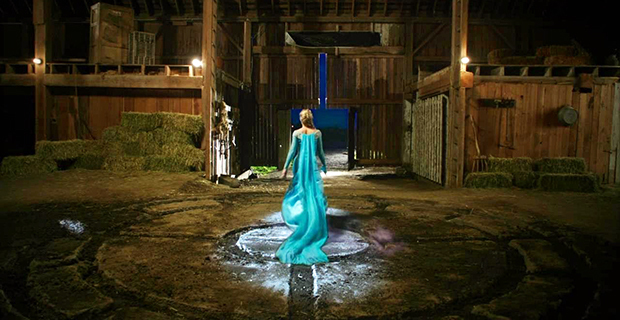 Why is Elsa suddenly in Storybrooke? Why is Anna’s necklace at Gold’s shop? Where is Kristoff? Misthaven? Does that name have any significance to our current characters? JOSH: I had no idea how “Once” was planning on doing “Frozen,” but after one episode I’m already sold. It appears they’re not trying to rehash the movie, which is smart. Instead, it looks like we’ve picked up after the movie’s events, with the flashbacks focusing on the days leading up to Anna and Kristoff’s wedding. Sending Anna to The Enchanted Forest (aka Misthaven, whatever that means) is in line with Anna’s adventurous nature and connects Arendelle with the main cast seamlessly. I also love that they didn’t fall into the trap of portraying Elsa as a villain. Just like with the movie, she’s shown here as a girl not entirely in control of her powers who only breaks out the giant ice monsters when she feels threatened. I still would love to know how she ended up imprisoned in Gold’s vault, considering I doubt she would ever intentionally try to harm anyone. Whatever’s going on here, I’m definitely intrigued. DAVID: Ugh can these two just bone already? Just cut them some slack, writers, and give them like 10 minutes alone together. I know this show airs at 8 p.m. but so does “Grey’s Anatomy” now. Don’t worry about Henry, Emma, he’s going to be fine no matter who you’re dating. JOSH: I don’t understand what the delay here is either. I thought they admitted their feelings for each other at the end of last season. Why is Emma still being all Emma about this? It can’t just be that she’s worried about what Henry will think, right? It’s not THAT soon after Neal’s death, and it’s only natural for two attractive people who just went on a time-traveling adventure to get cozy. So come on, Swan. Show Killian some love. I’d also like to note that Charming and Snow had nothing to do in this episode. Like almost literally nothing. Hopefully they get a storyline in the very near future, or else they might as well leave the show. DAVID: This poor woman. She’s arguably the most interesting and developed character on the show. What I like about her this season already is that she’s not reverting back to being totally evil – she could’ve let Marian die but didn’t. She is grieving for lost love but hasn’t created a new curse. The mirror twist is interesting, but then again I’m just happy to see Giancarlo Esposito on TV again (though the credits did give away his return before he appeared). More importantly: who do we think the writer is? And have we met him? And does all this talk of books imply there’s a connection between Anna and Elsa’s mother’s diary and the book of fairy tales? JOSH: Nobody has worse luck on this show than poor Regina. If anyone deserves a happy ending at this point, it’s her. I also like that she’s not going back to her Evil Queen roots. But I do like the idea that she’s trying to take control of her happy ending, which is something she should have done eons ago. Lana Parilla is a fantastic actress and has made sure Regina doesn’t come off as a caricature of evil. Hopefully she keeps it up and makes sure Regina doesn’t devolve into the Evil Queen again. And as for the book mystery, again, I’m intrigued. I bet finding out who wrote the storybook will be what bridges the first and second half of the seasons. Maybe next we’ll all be heading to a galaxy far, far away. DAVID: When these two started dancing, not gonna lie, my heart melted. And when he put the real dagger in her purse! I thought these two could enjoy their bliss. But I guess that’s not really meant to be, because Rumple will always crave power over love (at least maybe until a series finale? But that’s a ways off, my guess). JOSH: I LOVE the use of the “Beauty and the Beast” song during their dance. Subtle but perfect. And it seems like Rumple is going to try to be a better person (key word here is try), but whatever his connection to Elsa and Anna turns out to be will probably bring out his villainous side again. I really like that we haven’t completely gotten rid of his evil side, as opposed to the way I wish we could rid Regina of hers. Also, that hat at the end? Totally Mickey’s “Fantasia” hat, right? Am I crazy here? DAVID: Lots of animals/creatures this season. Also, they could’ve totally added Olaf to this mix. Do I smell a spinoff? Side note: did the CGI budget increase this season? Because the ocean scene in the beginning looked more real than usual. My bet is the “Frozen” hype dollars. JOSH: The CGI was noticeably better in this episode, especially the Troll. He looked, moved and sounded exactly like he should’ve based on the movie design. The ice monster, while still looking silly because he’s an ice monster, definitely moved more seamlessly than, say, the dragons did in previous seasons. And I’m so happy that Sven and Kristoff appear to have the same relationship they did in “Frozen.” The quick cutaways to Sven were hilarious. More of that please.